I will be leaving for a two-week vacation in a few days, and all my good intentions to typecast and blog regularly have flown out the window as I obsessively pack and re-pack, weigh and measure luggage, and wonder if I have left anything out. 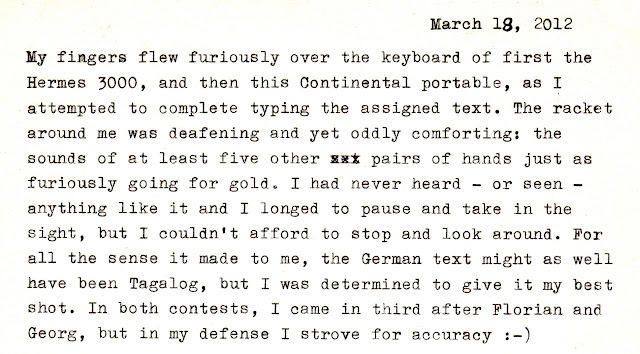 It is unlikely I will be posting again before mid-April, and while I had wanted to leave a more contemplative typecast up for that time, I don't see myself having enough time to conceive and type one before dashing off. 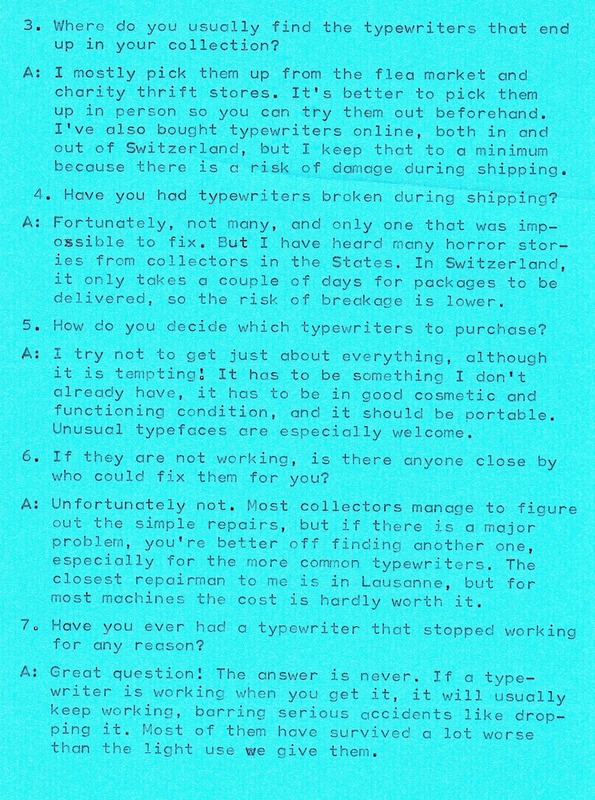 Hence, I shall leave you with a run-down of recent typewriter sightings in Basel and Geneva, and hope to come back to more responses to "21 Questions"! 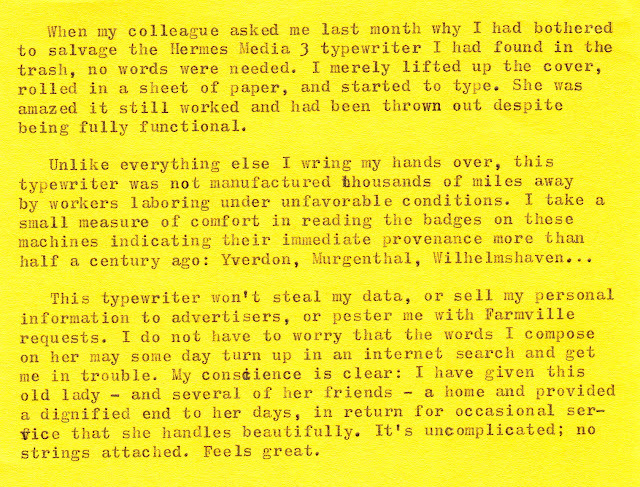 This Hermes Media 3 popped up a few weeks ago - the same day we scored a Valentine for $10, actually. 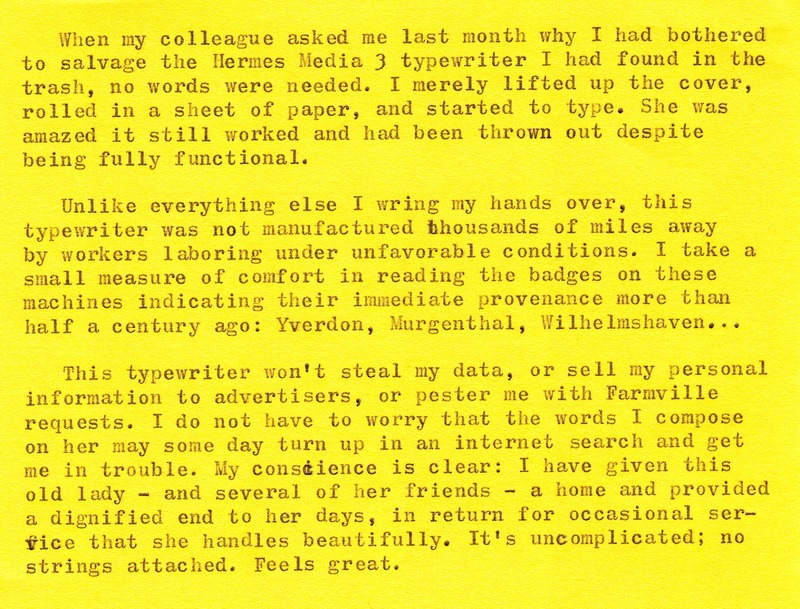 I examined it and it looked great - nice and clean with a techno pica typeface. The flea market in Basel was surprisingly productive - and sometimes just surprising. 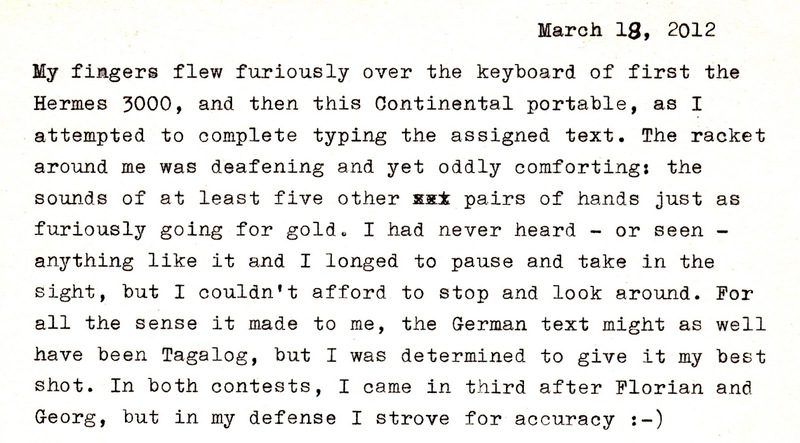 Here, a standard-size typewriter of who-knows-what make and model that has been spray-painted gold -- down to the keytops, type slugs, and paper. The seller gave us a demonstration to show it still worked! Spotted from afar in Petersplatz, Basel - a Valentine waiting to be discovered, offered for $65. 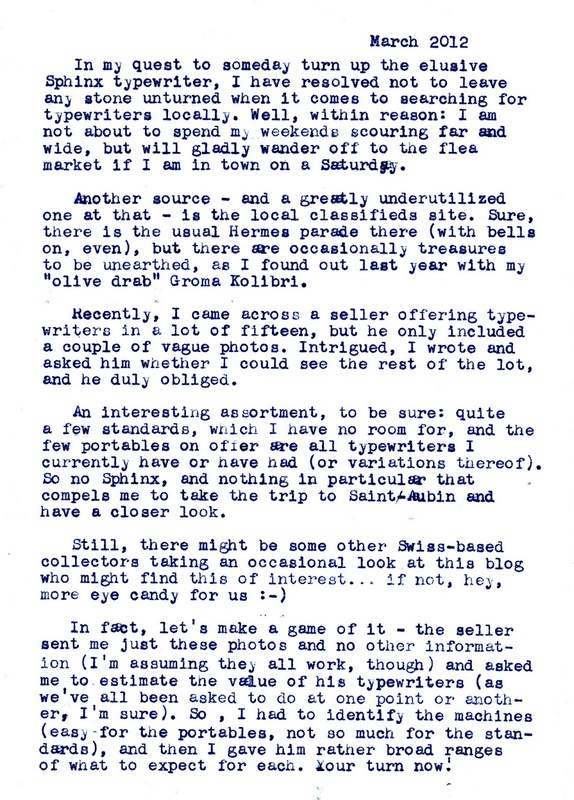 I think the seller would have had better luck if he actually displayed the typewriter - we knew what it was, of course, but I'm sure other observers were puzzled. I was excited to see this Scheidegger Princess-Matic, exactly like the one we have! And not in bad shape, either. 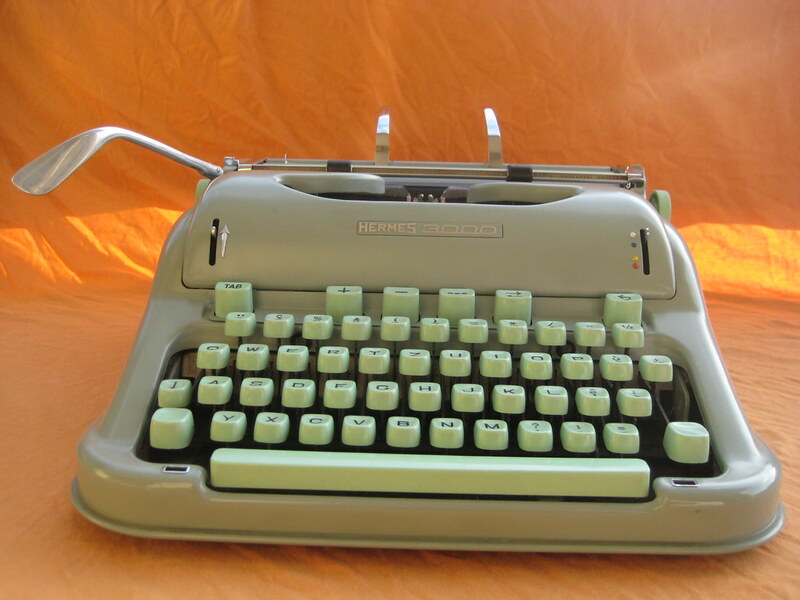 Next to it was this Brother, which is rapidly becoming one of the top five typewriters I see most often in the wild. Ah, this is a bit out of sequence: a bright yellow Adler Tippa spotted in Geneva three weeks ago. So tempted! 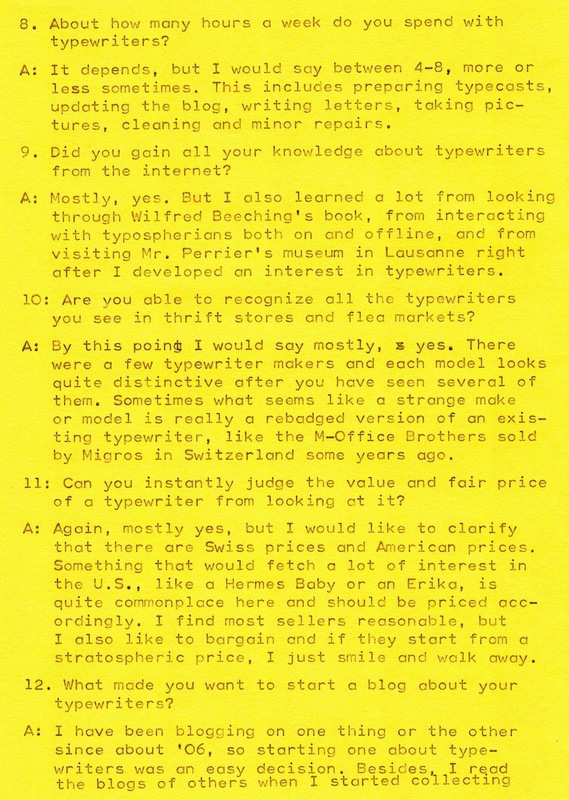 But the CHF 30 was a bit high for an impulse buy, and there wasn't a special typeface to compel me to fork over that kind of cash. Basel pulled out all the stops on this one: a beautiful, pristine, Mercedes Prima for only CHF 30. It was with great sadness that I pulled myself away from this one! However, I knew Florian would be bringing me a similar-looking Continental, so I didn't want a duplicate (or almost) quite so soon. Sigh. Back in Geneva, the ubiquitous Hermes Baby makes another appearance in a local thrift store, for a rather fair price of CHF 10. Good condition, but nothing special. Oho, so this is what happens when thrift store clerks take a look on the Internet - or maybe they just price by weight? CHF 100 on this (admittedly decent condition, but not that you can tell from my photo) Underwood standard is far too much to ask. Whew! 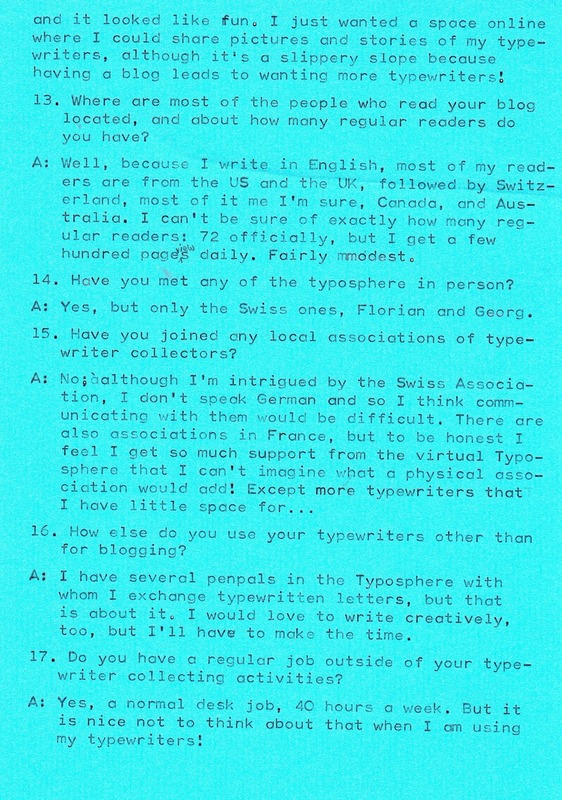 That was long - by no means should you feel the need to answer all 21 questions if you would like to take part; just select some which you think would be fun to answer. For the Tages Anzeiger article and its translation into English (ably carried out by Florian), please see the first item on my brand new "Press/ Mentions Around The Web" page. A very merry springtime to all! The welcoming scene that greeted us in the garden. Even before we arrived, Alfred typed our names on this Apex toy typewriter; how sweet! I hope occasional Instagram use is not too frowned upon - here, the train from Geneva (with stray foot). 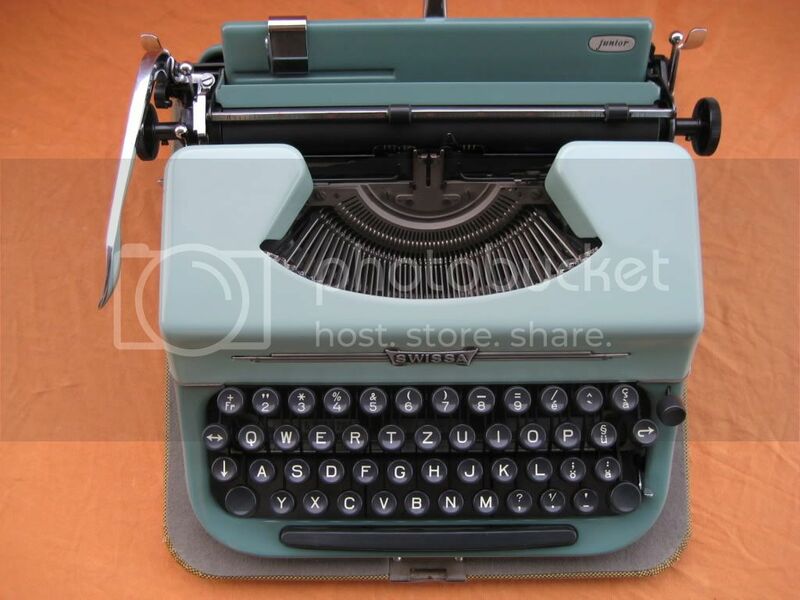 Also lurking in the garden was this giant blue Remington Noiseless, but I didn't have a chance to try it out. 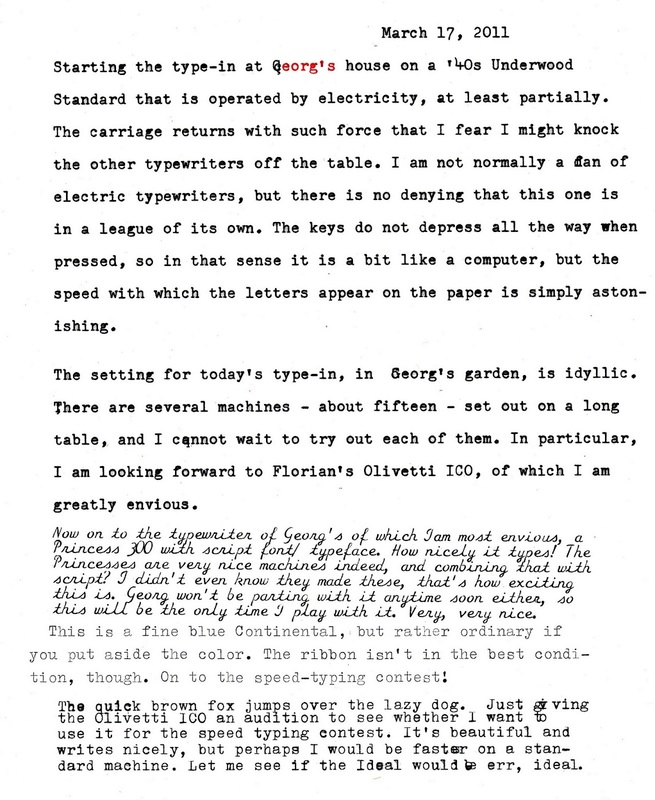 The Ideal Standard, which I hastily abandoned when even feeding in paper turned out to be difficult. 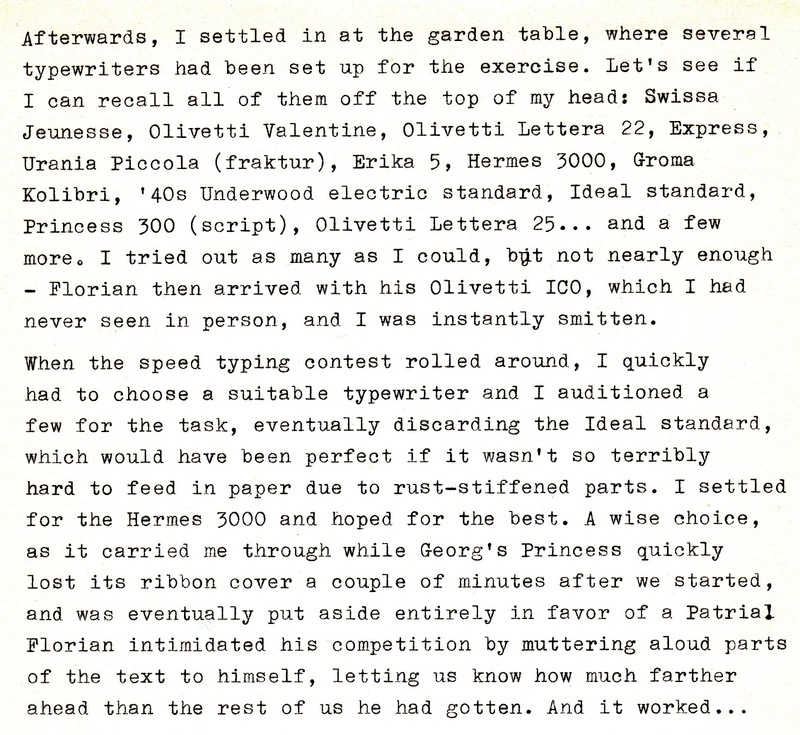 Florian's Olivetti ICO, with which he triumphed in the speed typing contests. 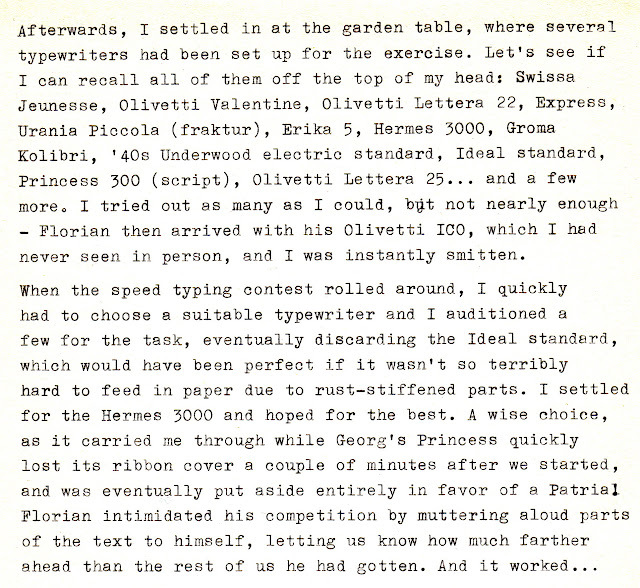 The results of the speed typing contest - note the Princess 300 ribbon cover, which came loose and was rapidly discarded! The cat was curious - aren't they always - but the turtle gleefully evaded capture. 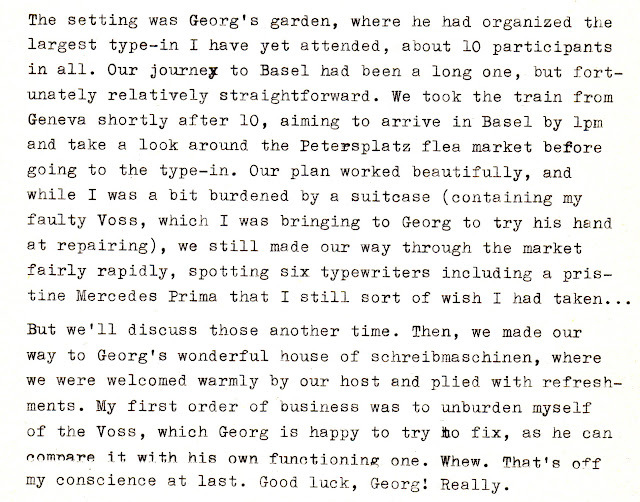 In his cellar museum, Georg shows us a very special Erika M.
The typecast I produced on the spot, using first the Underwood Electric, then the Princess 300. No words. Just... wow. What a presence, and what speed! Georg reappeared just as I was about to smuggle this off... sigh. 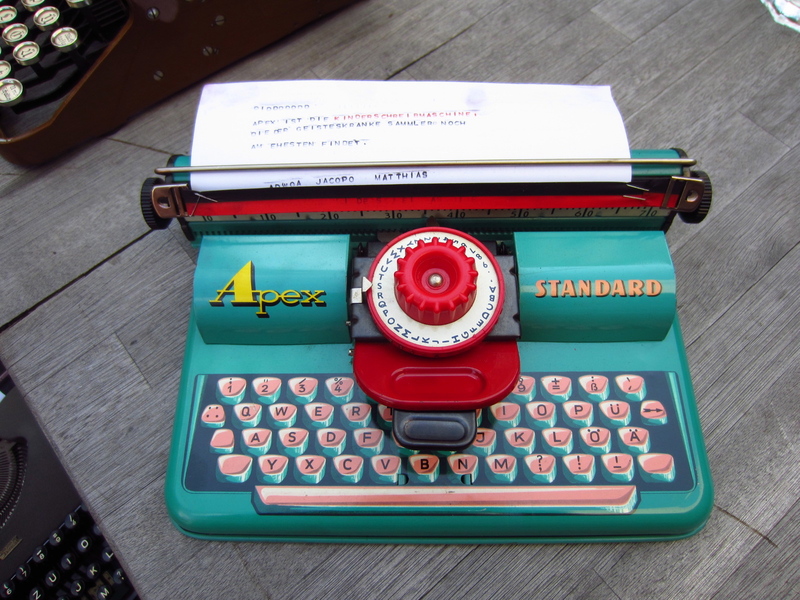 It was great to take a close look at unfamiliar machines, like this bakelite Express. 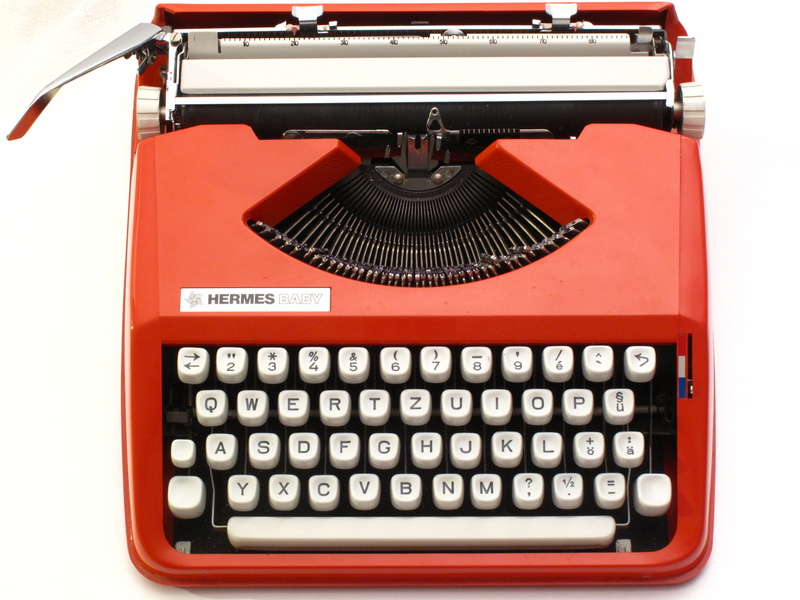 Among the machines I tried was this Olympia Traveller de Luxe (German-made, unlike mine), which made me revise my poor opinion of the series. It actually typed pleasantly well! Color me surprised. Could be that it's properly broken in, though. 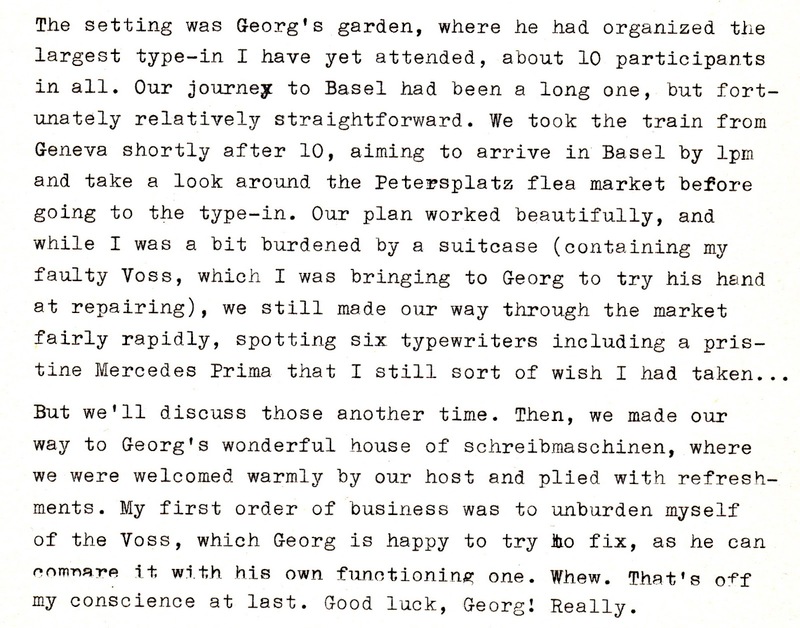 I loved the glossy blue of Georg's Continental portable, and the matching ribbon spools. 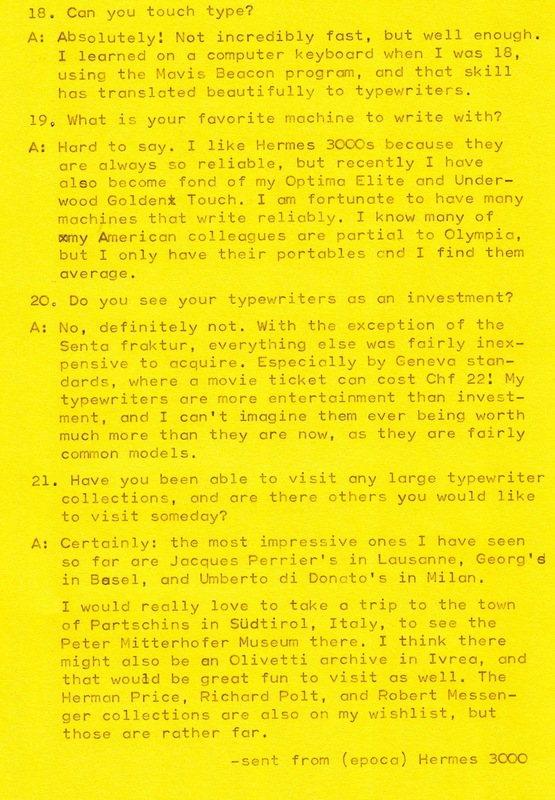 A first look at my own Continental (thanks, Florian!). While Georg's blue one is nice, I prefer the glass keys on mine. I also got to see - for the first time - the article about the Swiss typosphere that had appeared in the previous day's Tages Anzeiger. 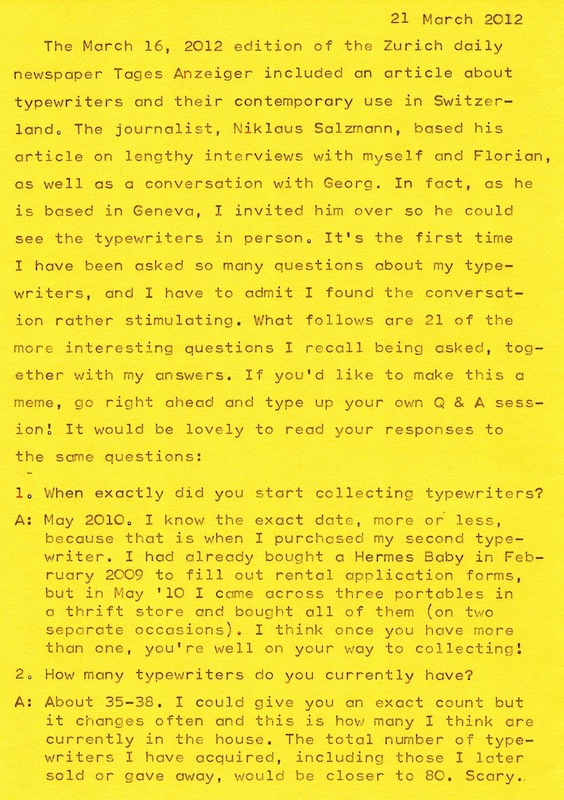 Waiting for the translation from Florian, but my first reaction was... "Sigh. 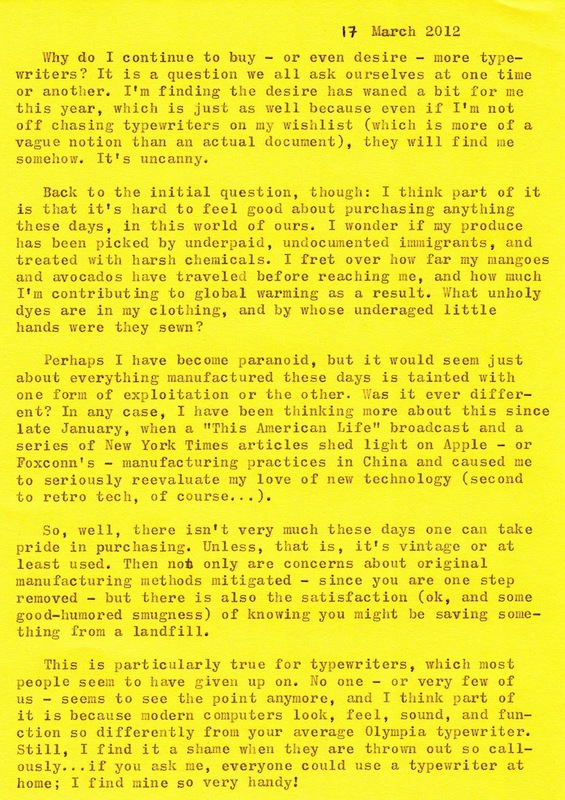 I suppose it's no longer possible to tell the story of Retro Tech Geneva without narrating the extraordinary saga of The Dress."